Low Density (LDPE) and Linear Low Density Polyethylene (LLDPE) bags are available for various low volume packing needs. They can come clear or printed with white block to add part numbers by hand. These bags can also be purchased with high graphics up to 6 colors if needed. 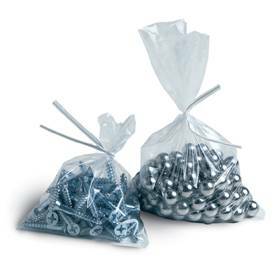 The LLDPE bags provide extra strength and puncture resistance compared to Low Density bags of the same gauge. Because of this, it’s often possible to use a lighter gauge LLDPE bag to do the job of a heavier gauge LDPE bag, which saves money and helps to reduce the environmental impact. Bags are made from virgin materials, so they comply with USDA and FDA requirements for use in food applications.